Imagine this: one day, you open Instagram to post a photo of your cat snoozing on an armchair, only to find a crop of dazzling new filters: Picasso, for example; van Gogh; Kandinsky. What if rendering your everyday surroundings in the familiar, yet strange, palettes of famous artists was as simple as selecting one from a menu? Of course, such a task is far from simple, but a recent paper from a German research team suggests it’s not entirely impossible. 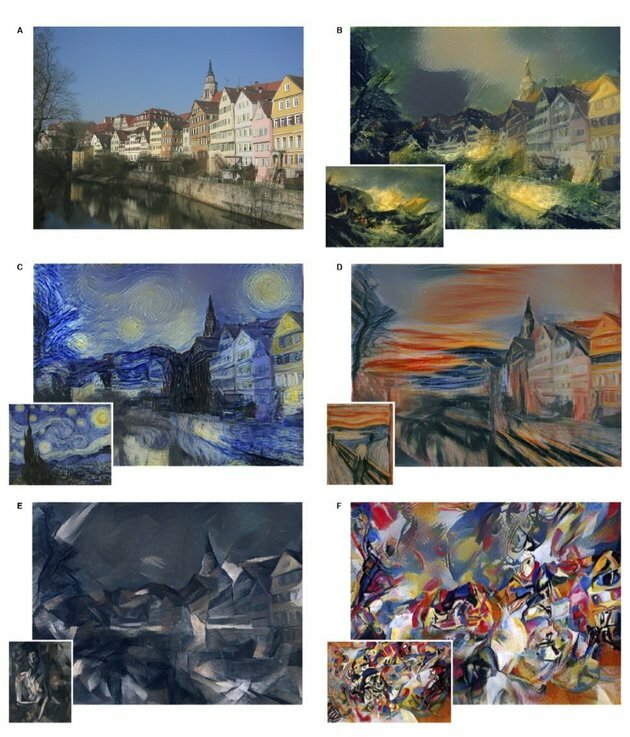 The researchers input a photo and a work of art into their model to achieve a combination of the content of the photo (a row of houses) and the aesthetic of each painting. 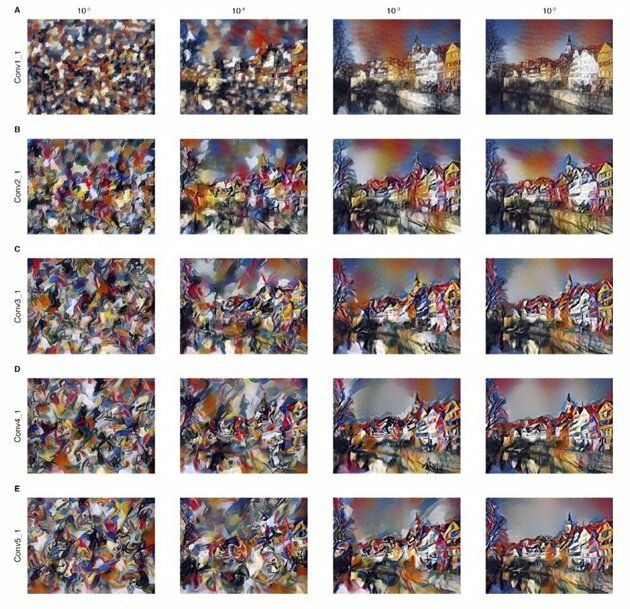 In the paper, “A Neural Algorithm of Artistic Style,” Leon A. Gatys, Alexander S. Ecker and Matthias Bethge demonstrate a visual model meant to allow the content and style of an image to be separated and combined in various iterations. 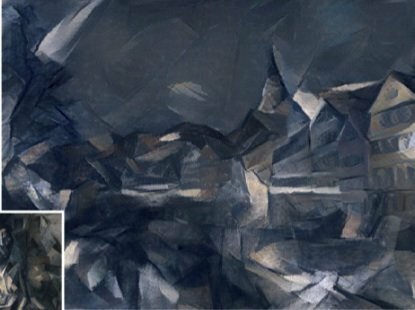 Inputting a photo of a row of houses, the researchers used their model to blend the content of the photo with the distinctive visual styles of famous artists such as Edvard Munch and Wassily Kandinsky. The model works not through a simple filtration — the authors point to non-photorealistic rendering and texture transfer as methods for stylizing photos in a more straightforward vein — but by processing each input image in layers, extracting characteristic visual components in a hierarchy. In other words, the authors weren’t simply applying a filter, but making choices about which input — style or content — to weight more heavily in creating the composite image, and aiming for a balance between the two. The results, as demonstrated in the paper, are stunning, and it’s tempting to quickly leap to the possibility of an app that could make us all look like the next Picasso — or at least give us a hint of what it would look like if Picasso painted our cat sleeping on the armchair. “The group should probably try to set up a meeting with Mark Zuckerberg,” advised Steadman. In the age of Instagram, we’re all talented photographers — or at least we’re a little better at convincing ourselves we are. Throwing a Valencia filter on a snapshot may make your amateur pic look a little more polished, but it’s a faint imitation of the care and craft that professional photographers infuse into their art. Blending “The Scream” with your own photo, on the other hand, may bear little resemblance at all to how the real Edvard Munch would portray that scene, and it certainly wouldn’t be an expression of your own creativity. The same photo, through a Picasso’s ‘Femme neue assise’ filter. The original authors aren’t necessarily making such startup-friendly claims. Their stated goals lean more academic, as they write that their model “provides a new, fascinating tool to study the perception and neural representation of art, style and content-independent image appearance in general.” The lab has previously geared similar studies toward ends that should delight art history nerds, such as a paper on using a similar model to determine the artist of a particular work using algorithmic stylistic analysis. Not as kitschy-fun as remixing your selfies through a Kandinsky filter, perhaps, but in the long run, probably a lot more beneficial for the art world. A Christie’s employee poses with Wassily Kandinsky ”Studie zu ‘Improvisation 3”’ artwork at Christie’s auction house in London June 7, 2013. Russian painter Wassily Kandinsky’s expressionist masterpiece “Studie zu Improvisation 3, 1909” was the highlight and leading indicator for a flat Christie’s London Impressionist and modern art sale on Tuesday. The painting fell short of its top estimate and a record for the artist at auction when it sold for just more than $21 million, the world’s largest auctioneers said on Tuesday. The early 20th century artist’s vibrantly colored painting of a knight on horseback was the highlight of the sale and had a top estimate of $24.19 million. 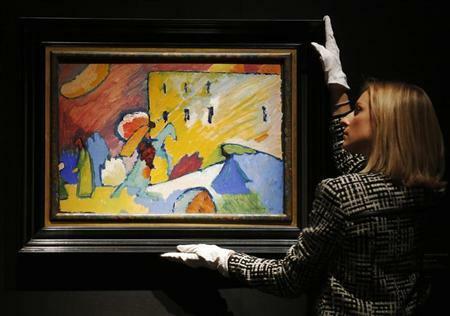 A similar painting set a $23 million record for Kandinsky’s work last year. The Russian expressionist was not the only leading light in an auction series of 44 lots that also included works from Pablo Picasso, Henry Moore, René Magritte, Amedeo Modigliani and Paul Signac. The auction total for the evening of 64.07 million pounds ($100 million) fell short of a pre-sale top estimate of 75.8 million pounds but was well above the low estimate at 52.8 million pounds. Jay Vincze, Christie’s London international director and head of Impressionist and modern art, called Tuesday night’s sale results “solid” and said it displayed continuing strength in selling rates. “There was great depth of bidding on works of high quality at all price levels, with strong participation from many new and existing collectors from both traditional and growth markets, including Greater China and India,” he said in a statement. “Studie zu Improvisation 3, 1909” belongs to Kandinsky’s revolutionary series of paintings, started earlier that year, known as “Improvisations,” which mark his first major forays into the realm of abstraction. The romantic image of a lone knight preparing to storm the citadel is a clear and repeated symbol in Kandinsky’s art of the dawning of a new age, of the coming of the Apocalypse and of the ultimate Resurrection of the spirit that would, Kandinsky believed, inevitably follow it. Among the highlights of the other lots in the sale, Modigliani’s portrait of his art dealer Paul Guillaume, one of only four, went for 6.7 million pounds, shy of its top estimate of 7 million pounds. Picasso’s 1960 “Femme Assise Dans un Fauteuil” edged just over its top estimate by going for 6.1 million pounds. It is one of a group of portraits of his partner Jacqueline Roque.